Neoprene gloves are good for what types of medical use? Neoprene gloves are a good match for virtually any type of medical use or procedure. They are durable and strong and are considered to be superior to latex in many aspects in high risk settings. These gloves are available as examination gloves as well as sterile surgical gloves. The thin, yet very flexible surface of the neoprene glove gives a high level of tactile sensation while still remaining very puncture resistant and tear resistant in all types of applications. In situations that are considered medium to high risk, as well as if latex allergies are an issue for either the patient or the medical staff, these gloves are a perfect alternative. While they can also be used as general examination gloves they are a bit more expensive than some of the non-latex options out there such as vinyl exam gloves. Are there different types of neoprene gloves and what is the difference? There are several different types of neoprene gloves. 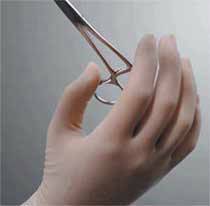 The most critical distinction in medical settings is between sterile surgical gloves and non-sterile examination gloves. In addition they come in powder and powder free options, which is typically a personal preference difference. Powdered gloves may be easier to pull on and remove since the powder provides lubrication inside the glove itself. Neoprene gloves can also be sold as smooth or textured on the fingertips. Textured fingertips provide slightly more traction or grip potential, ideal for handling medical equipment and supplies while wearing gloves. There are different colors of neoprene gloves on the market, although the most common color option is green. Can neoprene gloves make a good alternative to a vinyl examination glove? Neoprene gloves can be a great option to a vinyl glove, especially if constant glove changes are not required. The higher cost of neoprene over vinyl may not make this practical in larger clinical settings or in situations where multiple glove changes are required on an ongoing basis. For home health care providers they are a good choice over vinyl since they are stronger, more chemical and puncture resistant and tend to fit more snuggly to the hand. With no latex worries for either patients or medical staff these gloves are really worth consideration in wide range of examination and patient care applications. There are many types of gloves available, each for different uses. Neoprene gloves have their own unique qualities that make them more desirable for certain procedures. What is the fit like with neoprene gloves and is it comparable to latex? Neoprene has more elasticity than nitrile and vinyl, and tends to fit very much like a traditional latex glove. There is a fairly high level of memory in the glove, ensuring that it stays tight against the skin despite hand and finger movements and stretching. These gloves offer barrier protection against exterior fluids, making it very comparable to latex gloves. However, they cut down possibility of allergens, which adds to their appeal. The only concern with neoprene is that it will tear easily when punctured, which may be an issue in some hospital settings and home health care applications.